The Yankee Air Museum flew in a few planes for the 2009 Selfridge Air Show. 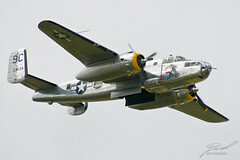 They also flew their B-25 Mitchell and C-47 Skytrain for the spectators. They did a couple of bombing passes with the B-25, but of course didn't drop anything. The explosions were all courtesy of a team on the ground. It was wonderful seeing these old birds flying. I think I'll have to make a serious effort to get out to the museum next year for their air show.